Free shipping. Buy direct from HP. 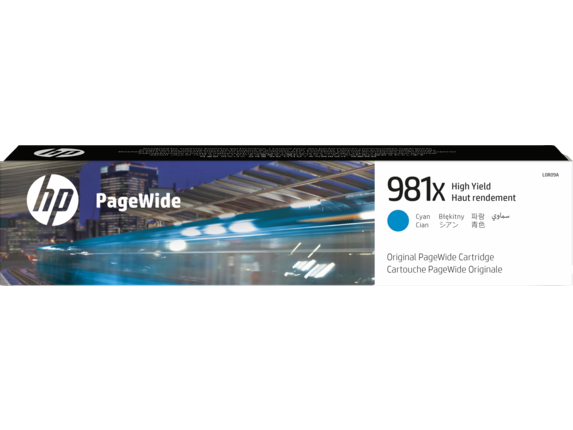 See customer reviews and comparisons for the HP 981X High Yield Cyan Original PageWide Cartridge. Upgrades and savings on select products. Count on professional-quality results at high speeds, using Original HP PageWide cartridges.Print professional-quality color on a variety of papers—consistent, reliable, and perfect for office use.Finish print jobs—even when a cartridge is running low—and don’t get stuck with a half-printed page.Finish print jobs—even when a cartridge is running low—and don’t get stuck with a half-printed page. Replace cartridges quickly and correctly with easy-open packaging and simple, fast installation.Print more pages from a single cartridge, using Original HP PageWide high-yield cartridges. Count on easy cartridge recycling at no charge through HP Planet Partners. Ensure consistent printing—Original HP PageWide cartridges are designed to work every time. Help reduce high-volume printing costs—high-yield cartridges deliver a lower cost per page than standard.Print more pages and replace supplies less often with high-yield cartridges.Print even faster—and save even more per page—by setting your printer to General Office mode. Avoid wasting time troubleshooting device issues, using consistent, reliable Original HP PageWide cartridges.Help ensure you’re getting the authentic HP quality you expect with innovative anti-fraud technology.Easily monitor supplies status from one central location, using HP Web Jetadmin. Replace cartridges quickly and correctly with easy-open packaging and simple, fast installation.Print more pages from a single cartridge, using Original HP PageWide high-yield cartridges.Count on easy cartridge recycling at no charge through HP Planet Partners.Ensure consistent printing—Original HP PageWide cartridges are designed to work every time.